It appears that the ALS Ice Bucket Challenge is all the rage these days, with not only the rest of the world taking part in their own willful dunking, but big names in the tech industry in particular. Our interest, being a tech news outlet, of course, extends more to the latter, and we always have a keen eye out for more and more top tier people taking the challenge. The latest participant, although most definitely top tier, is not a person – it’s Samsung’s Galaxy S5 flagship smartphone. 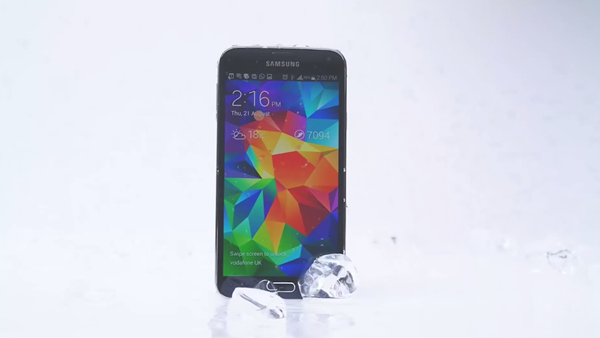 The challenge was announced through Samsung Mobile UK YouTube channel, and shows the Galaxy S5 taking a dunk in ice cold water. Of course, it’s not really a big deal for the flagship – its IP67 certification ensures that it can safely be submerged up to a depth of 3 feet of water for up to 30 minutes without incurring any damage, and therefore, the device came out of the challenge unharmed. What’s funny, however, is the nominations that the Galaxy S5 has made during its own dunking. The Korean top tier phone has nominated HTC One M8, the iPhone 5s and the Nokia Lumia 930 to take the challenge. It’s funny because Galaxy S5 is the only device amongst all these that has waterproofing. Nokia and HTC both claim water resistance for their phones, but they don’t match the S5’s IP67 level of submersion. The iPhone 5s, on the other hand, has no water resistance whatsoever, and has always been plagued by water damage issues. Hence, extending this challenge to these devices is Samsung’s way of poking fun at its largest competitors, as well as cleverly advertising another feature of the flagship phone. Speaking of features, the Galaxy S5 has always been coveted by consumers for having a proper waterproofing mechanism as opposed to other top of the line choices, and in fact became the deciding point in making a purchase decision. Samsung has marketed this difference in the past as well, and making use of the hype around ALS Ice Bucket Challenge these days is definitely clever marketing. Also, the Korean company is not insensitive, should anyone tend to have that thought; Samsung clarified that it released the video to support the Motor Disease Association, and urged people to donate. Why it didn’t challenge Sony? Too scared because it is the original water resistant?